The Mercedes-Benz 290 (W18) was produced from 1933 to 1937, had an inline six and different chassis sizes. The shorter chassis was 113 inches and came in a variety of body types. Mercedes offered a sedan, four door "Tourenwagen," and two and four door convertibles. You could also order the chassis and have it custom built by your favorite coach builder. The longer chassis was introduced one year after in 1934. The longer chassis meant an additional 17 inches of leg room, putting the car at 130 inches long. In addition to the body types offered on the shorter wheelbase chassis, the longer wheelbase offered a "Pullman-Limousine" style as well as coach built work. We are always looking for classic 290 Cabriolets to buy. 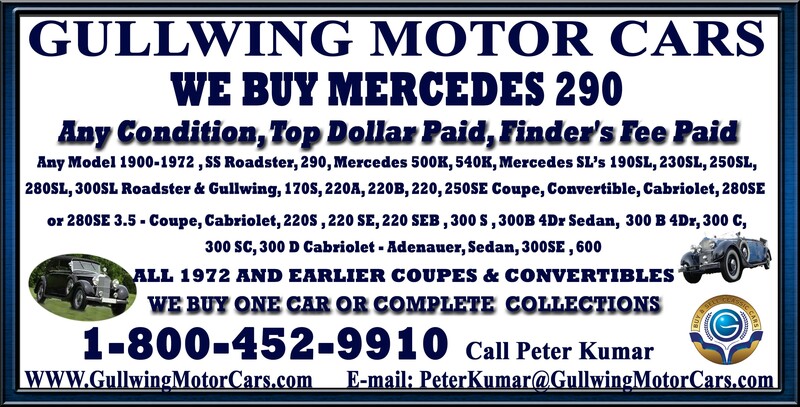 If you have a 290 Cabriolet for sale we can help you determine its value. If you know someone who has an older or classic 290 Cabriolet for sale, let us know! We pay finders fees! Whether it has been sitting in a barn or a field for a long time, or it's a garage queen, we buy in any condition. Location is never an issue. We buy cars from all over the United States! Peter Kumar has over 27 years of experience. Please give us a call if you are considering selling your classic 290 Cabriolet.